The Siri Pemikiran Kritis (“SPK”) is a flagship event organised by the Bar Council National Young Lawyers Committee (“NYLC”) to promote intellectual discussions on civil liberties with a legal twist. The forum commenced in 2007, and since then NYLC have organised more than 15 such forums. Every forum is designed to initiate critical and mature thinking that encourages responsible and measured debate and discussion amongst the speakers and the attendees. The last forum, held in June 2012, discussed the proposed alternative Bar. It was well attended by Members of the Bar as well asthe public at large. The purpose and intent of the forum is to have a general and critical discussion on the jurisprudence and the operation of the newly-enacted Peaceful Assembly Act 2012 (“Act”). The Act is the law that regulates public protests in Malaysia. Proponents of the Act state that the Act allows citizens to organise and participate in assemblies peacefully and without arms, subject to restrictions deemed necessary and in the interest of public order and security. 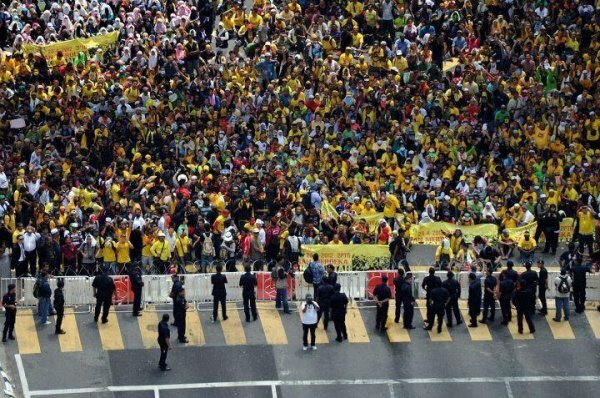 The Act was drafted four months after the BERSIH 2.0 rally and two months after the government announced its intention to amend the Police Act 1967. The Bill was tabled in Parliament on 22 Nov 2011, passed by the lower house on 29 Nov 2011, and approved by the Senate on 20 Dec 2011. The Act has been strongly criticised by various quarters that argue that the Act will diminish the right to protest instead of safeguarding it. The Bar Council and various civil society leaders have also spoken out against the Act. Posted on 27 July 2012. You can follow any responses to this entry through the RSS 2.0.